Hello!!! I just started a Youtube Channel and now I can finally share my music w/ you in a modern and newfangled way. :). Here’s the link to My YouTube Channel. If you’re interested in purchasing a copy, please email me at the address listed above and I’ll send you and invoice and a secure method of purchasing it online. Thanks in advance! I have a very important question for you? I’m in the process of making a new album and it is getting expensive. Because of this, I’m thinking about next steps. Do any of you have any interest in PRE-purchasing my next CD for $15 per disc? It’s going to be a high end recording, produced by the ever so talented Tim Lyles (who will be playing numerous parts given he cowrote 2/3 of the tunes with me). And, it will be engineered up at Gildersound. The sounds coming out of Randy’s studio these days are high quality. He has a little Abby Roads replica up there. So, if you’d be interested in PRE-purchasing the new recording, please let me know and I’ll send you a PayPal invoice. I’m also offering sponsorship opportunities (my own version of GoFundMe). Folks who sponsor $50 or more get a CD, a professional quality photo from the studio session, and their name on the liner notes. Folks sponsoring $150 or more or get two CDs, the photo, and a private house concert or 3 pack of guitar lessons. 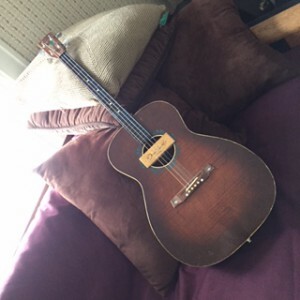 Anyone tossing me a wildly crazy large check (over $300) gets the cds, the photo and my old tenor guitar. (update, the tenor deal was taken up and is no longer an option – thanks Cylver, love you kiddo). Should any of these opportunities interest you, please let me know at lisa@lisakane.com. The Long Goodbye was an absolute blast to make. Absolute blast. 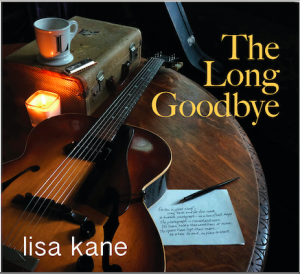 The Long Goodbye (thanks Keely for thinking up this title) definitely hits some classic rock elements as well. My love of The Band, Stevie Nicks, Buffalo Springfield and Tom Petty bled through. This is where Rich especially excelled. He figured out how to blend sounds and styles perfectly, keeping the record grounded in fundamental country elements, while adding catchy riffs and incredible guitar solos. Another favorite part of this record for me is the artwork. Larry May completely understood this project. He’s a good friend and knew I wrote the majority of songs while living in Duluth. And, he knew my eight years up north were the loneliest of my entire musical career. He took that knowledge and turned it into six panels of seclusion. All and all, I’m very excited to share this record with you. I’m not sure if I still have a following, so I don’t know what size venue to release it in yet, but I am hoping to put something together soon. 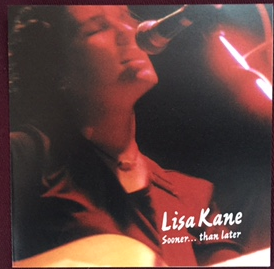 In the meantime, if you want to pick up a pre-sale, email me at Lisa at Lisa Kane dot com. 2017 is off to a great start. Even though the goal for 2016 was to release a new recording, I’m actually grateful for the delay. It means listeners can expect more new material than ever before. I guess taking a decade off from performing will do that to a writer. It seems the songs just keep coming and I’m feeling blessed beyond blessed. So, what lies ahead seems to have three different tracks. The first track, which is already underway, is to record the country album my parents have always wanted me to make. 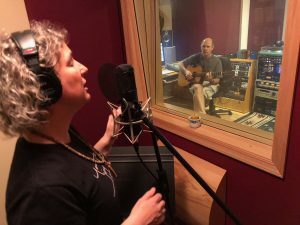 In order to do this, I’ve reached out to Rich Mattson from Sparta Sound (Ol Yeller, The Tisdales, Bitter Spills and Rich Mattson & the North Stars) as producer and engineer. We’ve had a bit of help from Keely Lane (Trailer Trash and Ol Yeller), as well. This upcoming eight song EP will hopefully be ready for release in December of 2017. Also in the works is a second project with my buddy Mike Bruns (Ride, Rizosphere and Bayou Hazard). Mike and I are reworking a few of my bluesier/funkier songs, arranging them in new ways, and recording them in full band style. There’s no telling how long this project will take to finish, but so far we’ve been meeting at his studio every Wednesday morning and we’re both committed to the project, so I’m hopeful we’re looking at a 2017 release as well. Last, but in no way least, I’m waiting for an opening to get into The Hideway with Joe Mabbot and my dear friend/mentor Tim Lyles. Tim and I have cowritten a catalog of material over the past year. Our songs are melodic and acoustic guitar driven. The biggest challenge we have is finding the time to make a new recording happen. But, my fingers are crossed that we will find the time soon and have something new to share with you all before 2017 comes to a close. A quick She Shells update. We have finished recording our first album and are very happy with the results. Rich Mattson at Sparta Sounds did a great job engineering the project and our next step is to get it mastered. I promise to keep you posted as we go. Okay, another quick update to share. The record is finished. Alison Ross did an amazing job mastering it and we now have a limited edition run to sell at live shows. Only one hundred copies available. Get one quick. I don’t think they’ll last long. 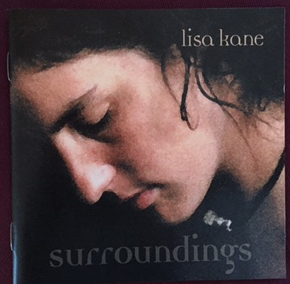 2016 will be a musical year for Lisa Kane. Rehearsals for the new studio project are already under way. Songs on the upcoming release are different from Lisa’s previous work. She is undoubtedly following her heart back to the edgier/electrified guitar riffs and hypnotic grooves that sparked her career. The new material is a natural fit for both The Current and KFAI. From edgy pop melodies reminiscent of Missing Persons and Husker Du to back beat guitar riffs inspired by a lifelong love of Cowboy Junkies, Patty Larkin, Emmylou Harris & Spyboy and Jimmy Hendrix. 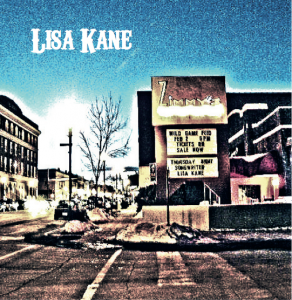 On this recording, you’ll hear what you’ve always known; Lisa Kane dances to her own drummer and her drummer likes to rock! 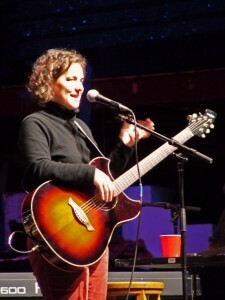 While Lisa was away from the Twin Cities (2006-2015), she spent as much time writing short stories as she did playing guitar. Musically, she engineered and self produced a currently unreleased compilation. The few people who have heard this recording call it her “Nebraska” album. Lisa had held down a day job as a sexual assault advocate in a women’s shelter while she was away. After that she became the director of a nonprofit dedicated to reproductive justice and access to rural health care. Given this, the “Nebraska” reference makes sense. 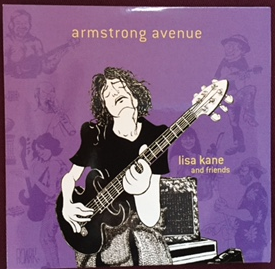 In 2005, Lisa released Armstrong Avenue. It was a self produced recording she engineered on a Roland VS880. Local talents like Gabriella Sweet, Charlie Van Stee, Crystalline Ruby, Dan Rumsey and Karen Mueller lent a hand. The result was a well received compilation of songs still played on community radio and internet stations today. In 2002, Lisa released Surroundings. Tracks from this compilation stayed on KFAI’s rotation for 15 consecutive weeks. 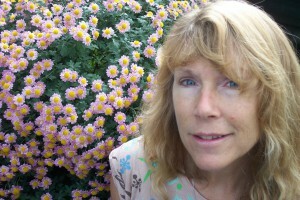 One, Mother Nature’s Pace, was featured on MPR’s Living on Earth. This album was nominated for Acoustic Album of the year with The Minnesota Music Academy as well. 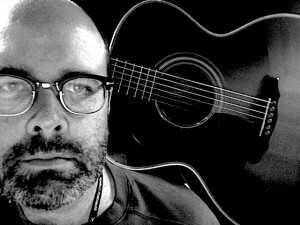 Randy Gildersleeve at GilderSound Studios engineered and co-produced Surroundings. 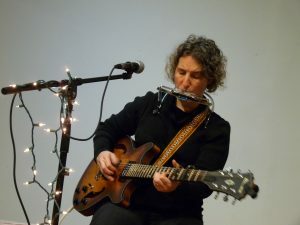 Thea Ennen, Tim Lyles and Crystalline Ruby are a few of the many talented musicians who accompanied her. In 2001 Lisa released Sooner than Later… This project was engineered by Terry Eason. It was the first and only time Lisa released a compilation of songs where she played solo. One woman, one voice, one guitar. It was a limited release, but quickly became a fan favorite. 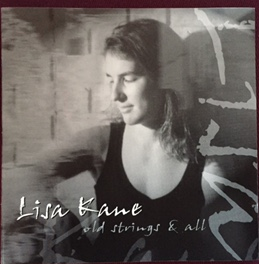 Lisa’s debut album Old Strings & All was released in 1999. It was engineered and coproduced by Randy Gildersleeve at GilderSound. Kari Larson, Jay Cook and Tim Lyles accompanied her on this project. This album received a lot of attention on KFAI’s WomenFolk, KTNA (Telkeetna, AK) and KAXE. A few songs made their way to Twin Cities compilation CDs as well. Most notable are: Minnesota Homegrown and Voices in the Wilderness. 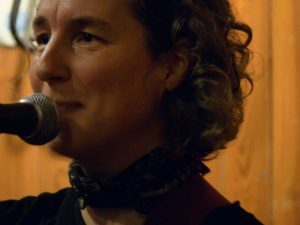 Lisa emerged on the Twin Cities scene in 1995 as a co-lead guitarist in the all female metal quartet (hair band) Zelpha Trippe. ZT, previously known as Two Real Eyes, recorded several cassette tapes with Brian Bart at Logic Studios. There is no doubt Lisa’s time with Zelpha Trippe impacted her playing. ZT, was often referred to as the all girl version of RUSH. The early years influenced Lisa’s live performances as well. 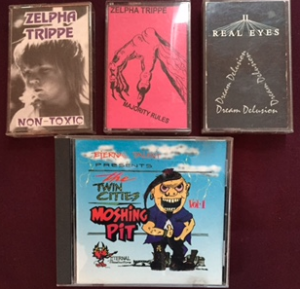 ZT often shared stages with other female bands, No Man’s Land and Hester Mofet to name only a few (only because there were only a few back then to mention). Playing with other women influenced Lisa’s wardrobe as well. Here she can be seen wearing an outfit loaned to her by ZT’s bass player, Wendy. She can’t remember who helped her with the makeup, but knows for a fact that her hair was actually this long. Before ZT, Lisa played in a high school rock band called Fair Warming (named after a Van Halen song). FW had one concert to mention; Parent’s Nights. Those who attended agreed. Fair Warning should play country. My breech baby. A compilation of songs I refer to as the verse/chorus compilation or prose put to sound. I don’t really know what prevented, or still prevents, me from releasing this disc. The pieces are all there – even the artwork. Dawn Yemma had once again volunteered her amazing talent and design – which I absolutely LOVE. Thanks again Dawn. YOU are an amazing friend and extremely talented person. You see light in the darkest places. The cover comes from a photo of a Zimmy’s marquee promoting a solo gig I had. Zimmy’s was always a lot of fun. Linda and Bob were very good to me. I came in as a top three finalist at Zimmy’s, two different times, in their Dylan Days Songwriting Competition. The first time I competed, I qualified with a song called Northland Girl. It came to me on the Superior Hiking Trail. It’s my take on who Dylan’s Northland Girl was and where she might be today. I took second place with this song. Then it turned out the first place winner couldn’t accept the prize; an opening slot for Maria Muldaur at the Hibbing High School. So, I was given the opportunity and I performed on the same stage Dylan was booed off of as a kid. I’ll attach a pic. Thankfully, I was warmly welcomed by the audience. I think I felt a touch of Dylan’s residual energy floating around as well. I qualified in the top three at Dylan Day’s a second time. The song I performed was called Old Man Raven. I wrote this song during a late spring (aka Duluth’s mud season) cold snap. I went out early to check on the tender little starts in our greenhouse, bringing my backpacker along with the idea of singing the little sweeties a song (I was desperate for them to survive) and the melody for Old Man Raven appeared. I must have gone out right after our neighbor dumped some kind of kitchen-scrap concoction in her open air compost bin, because while I wrote my song a handsome flock (Murder of Crows?) swooped and cawed out in gratitude. I was equally grateful. I have always loved singing and playing Old Man Raven. The engineering of this project did not come as easy as the songs. 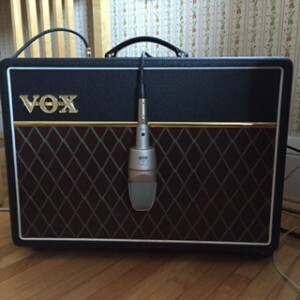 When I first moved to Duluth, I kept a couple dozen guitar students in St. Paul and commuted. Wonderfully generous folks like Gabriela Sweet, Mike Bruns, Barbara Spenader and Tom Roark let me crash on their couches. And, seeing how I was already in town, I decided to record this project at a studio in Minneapolis. I had a really nice Yari that the engineer was willing to trade for studio time. The tracks from the sessions were amazing. I flaked out a bit on the producer though and completely dropped off when I ran out of funds and guitars I could afford to offer. I’d also started grad school by then and was EXHAUSTED. Still, something kept gnawing at me, so between classes and a new part-time job in Duluth, I recorded several more songs in my basement using a Roland VS880. These recordings sounded almost as good as the studio sessions. The combined result was a compilation of songs I believed to be strong enough for print. Plus, the vocals turned out the way I’d hoped they would. I performed solo almost the whole time I lived in Duluth and had started putting more emphasis on melodies. 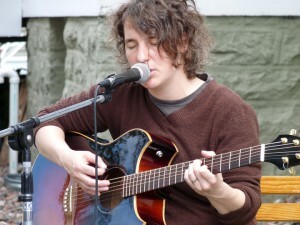 Here’s a pic a solo gig in Two Harbors at an annual art fair. I still can’t tell you why I didn’t release the album. It had artwork I loved, vocal tracks I liked, and two songs good enough to win songwriting competitions. And, I had contributions from local artist who added a lot seasoning. Pat Eliason, whom I’d met at Zimmy’s, played an amazing harmonica track on Margo’s Song. He was in the competition too and we become fast friends. Still are. Then there was Waabi Furo. I sold him a tenor guitar (Sadly, I sold all but two instruments from my collection to pay for grad school). While Waabi was testing out my tenor, I grabbed a guitar and offered up a jam that we later recorded and called Esther. Waabi, I still owe you a nice dinner. I haven’t forgotten. Last but not least, was Rachel Nelson. We were special guests at an Echos of Peace concert when we met. I’d already booked Homegrown and asked her to join me. It went so well that I asked her to sit in on a recording session. She said yes and brought a prose/ramble of mine to an incredibly new place. Rachel always does an amazing job. So, even though I can’t get past my hesitation to release the latest album, it has been very nice to have this opportunity to explain to you the decade of dead Lisa Kane air. Well, not dead air, more like radio silence. There were quite a few noteworthy gigs with Thea Ennen that I’ll write about at a future time. Okay, I’ll head over to SoundCloud now and load the songs that Rachel, Pat and Waabi contributed to. And, just for the heck of it, I’ll add one of me accompanying myself on tenor. Here’s my SoundCloud link: https://soundcloud.com/lisa-kane-344185105. I hope you will like what you hear. All photo credits belong to Carrie Chomicz (except the tenor pic). This year is off to an amazing start. We’re less than two weeks in and I’ve had the honor, pleasure, and priviledge of cowriting with Ms. Thea Ennen and Mr. Tim Lyles. Both Tim and Thea have been extremely influential on my musical style, writing, all around approach to guitar playing, and life. I feel blessed–to say the least. The songs are different from what I’d normally write, which is such a gift. And the point. Collaboration is truly an amazing process. I like it a lot. I feel like I’m stretching and reaching new places on guitar, vocals, and with song structures/formulas. With Thea I’m learning to intentionally harmonize (some of you will know what I mean by this. Sometimes harmonies come naturally and give you shivers, other times, they are work and take concentration and intension). I’m accompanying Thea’s piano playing and alluring vocal melodies with a little bit of lead guitar and tenor. Sprinkles of flavor – here and there. With Tim, we take song structures and chordal movements to a whole new level. In fact, my fingers and hands ache after sessions with him. I can’t tell you how wonderful this is to feel. Aches and all. Tim’s got that back on the beat g uitar playing style that I absolutely cherish. And, how wonderful is it that Tim is the one musician who I’ve played with the longest in my life? I remember making a decision to buy a really nice acoustic over a decade ago and asking Tim to play it for me so I could hear it from the front and then decide. He made it sing and I still have it. And, he still makes it sing. My goal over the next few months is to record demos of the songs Tim and I create and make them available on SoundCloud. 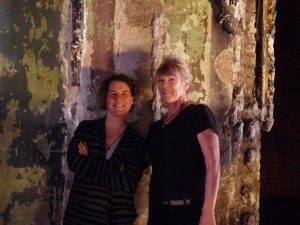 Thea and Lisa songs will hopefully be compositions you can hear us play live at a venue near you. We just need to land a few gigs. Anyone have any recommendation of places we should/can play? Microbreweries and happy hours are hands down my first choice for venues right now. As always, thanks for the amazing support you give. I’m in love with music and so grateful to have the chance to share my passion with y’all.